Tracking a person at the park is another trick that your dog will need to use his nose for. You will need a helper for this. Teaching a dog to track is great fun. Have your dog on the leash for this take him, some treats and your helper to a local park or woodland. You may be better using a harness for this as a dog can pull keenly on the leash when tracking. Ask your helper to show the dog a treat and walk away scuffing heavily on the ground with his feet then to hide out of sight. Tell your dog to find the helper, encourage him to work with the scuff marks in the ground initially because you will need these when you are teaching longer tracks. 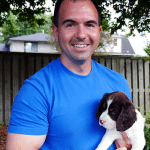 You can do this by reinforcement and reward of your dog sniffing the ground to move forward. When you reach the helper ask him to give the dog lots of praise and a reward. Now simply practice and make the tracks longer and more complicated, use the dogs learning pace because that will keep his confidence high. Top tip; Tracking will need to be learned over a number of weeks, it can also be a full time dog training hobby on its own. 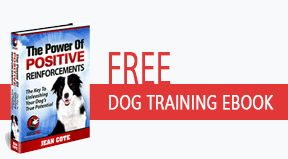 Dog trainers love this trick because it will wear out even the most energetic of dogs.